No child will feel left out with these Print and Go Mother's Day Gift Books that come with everything you need for your students to make a gift for their Mom and all the Special Mother Figures in their lives! All you need to do is print, and your students will color, cut, glue, and decorate with crayons and markers. These craft activity books will make students excited because their gift was made with love. This Mother's Day Craft Book is for Moms, Aunts, Grandmother's or Special Women in lives of ALLthe students in your class. This set offers several options for students who do not have a mom, but have other women who are filling the role of Mothers in their lives. 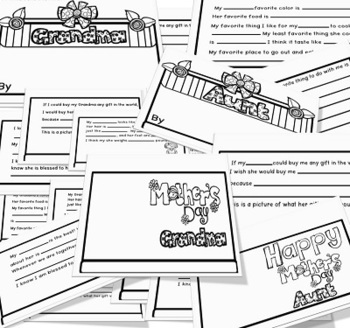 This resources is also the perfect gift for those limited on money, but still want to let want their students to be able to make and give a Mother's Day Gifts to their Moms! This set comes with Several Different Versions. I will update set with new dates after 2019. • Depending on the ages of your students will depend on how much time this craft book takes. When I taught 3rd Grade, we spent 30 minutes each day for 5 days working on two pages each day. I chose to do it this way so the students really put thought into each page, and spent time decorating each page. • I have included a note for you to send home ahead of time asking for a picture of their Mom, or guardian. 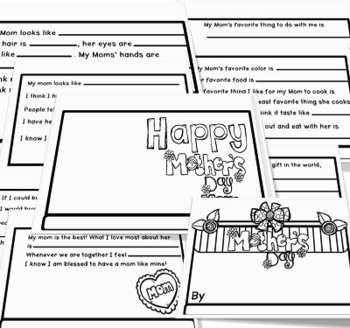 If you do not want to ask for a picture, students can draw and color their own picture of their Mom or Special Lady. • There are many ways your students can make these books really stand out, or you can keep it simple and just let them color and staple together. I have included several ideas for you to add details to this set, but they are not necessary. 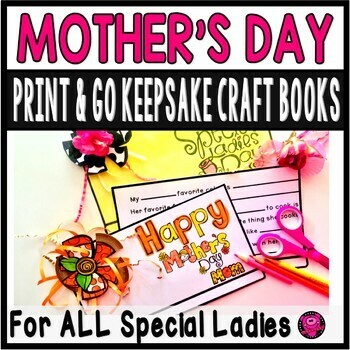 You will find the possibilities of the Simple Print and Go Mother's Day Books are endless and will be a go to Mother's Day Craft year after year. CLICK HERE to CHECK OUT MY FIREFLIES INTERACTIVE BEGINNER'S RESEARCH FLIP TAB BOOKS. 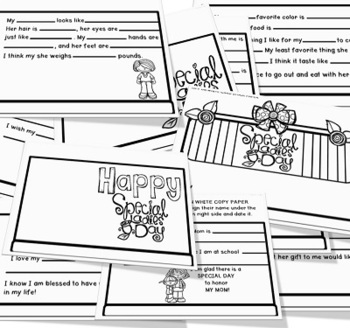 CLICK HERE to SEE MY 50 END OF YEAR BLACK and WHITE CLASSROOM AWARDS! You get HALF OFF ALL MY NEW PRODUCTS the FIRST 24 HOURS POSTED! I am posting NEW PRODUCTS WEEKLY so be sure and CLICK the GREEN STAR by my store name to become a FOLLOWER, and SAVE 50% off my products.